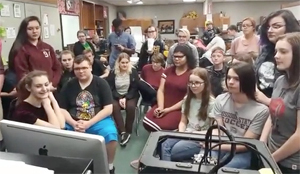 The theatre program at Henryetta high school is getting a major boost. Today the school was notified that it would receive $10,000 through the NBC broadcasting network’s R.I.S.E. America grant program. Henryetta was one of 50 schools across America to receive the funds. The program is inspired by the NBC upcoming drama “Rise” about a high school theatre department and its effects on a small town. Each of the 50 schools received $10,000 for a total of $500,000. Henryetta was the only school in Oklahoma to receive the award. Liz Bealko, who directed last year’s performance of "The 25th Annual Putnam County Spelling Bee," and is getting ready for rehearsals for “The Wizard of Oz,” was instrumental in getting the grant written and submitted. Bealko told the cast and crew of this year's production about the award via Skype shortly after the national announcement was made. She explained the funds would be used to purchase microphones, build sets and take a field trip to Tulsa to watch a live stage production. "You all inspired people around the nation," she said. "I'm so proud of you. This is part of a movement that is really getting recognized. This is such a good push for us. The program will survive for years." Bealko said she was able to get the application submitted the day before it was due. Part of the applicationwas an essay and she said one of the judges said he read it and he, "knew we would be a winner." Through R.I.S.E. (Recognizing and Inspiring Student Expression) America, the NBC award will cover the critical needs of their theatre programs ranging from production expenses to technical equipment and master classes. NBC is facilitating the program in partnership with the Education Theatre Foundation (ETF), a non-profit organization dedicated to shaping lives through theatre education. A DVD video from the RISE cast congratulating the students was given to the school. Henryetta students have already been busy this year raising money to stage the Wizard of Oz. They have held everything from bake sales to cabarets. Two special cabaret performances are scheduled Friday evening at 7 and Saturday at 2 at the Shack in downtown Henryetta.